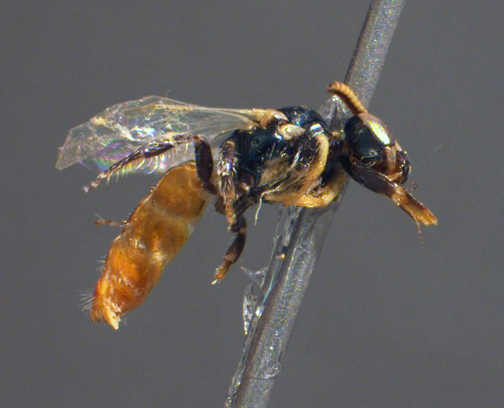 BIO-WEST and Utah State University scientists say they are elated by the recent discovery of two new bee species in the Ash Meadows National Wildlife Refuge in Nevada. BIO-WEST was contracted in 2006 to complete a variety of ecological investigations for habitat restoration at Ash Meadows. To assist with a pollinator study, BIO-WEST subcontracted with USU. David Tanner, a biologist and postdoctoral fellow at USU, and two graduate students were collecting data for the pollinator study, which examines the relationship between pollinators and rare desert plants, when they stumbled across the previously unknown bee species. The newly discovered insects, each distinct forms of the genus Perdita, have not been named yet, but Tanner and a fellow professor in USU’s Biology Department hope to assist with the process. According to Tanner, the discovery wasn’t a complete shock because desert areas like Ash Meadows are home to some of the greatest biodiversity of bees in the world. Tanner’s discovery is only one of several new finds that have resulted from BIO-WEST’s investigatory work at Ash Meadows. However, because bee populations are declining worldwide, Tanner’s discovery has been especially welcomed by the scientific community. Other BIO-WEST studies in Ash Meadows include plant-reproductive biology, small mammals, amphibians and reptiles, bats, avian species, soils, rare plants, and vegetation communities. In the near future, studies examining which bee species could serve as what Tanner terms “alternative, supplemental pollinators” for honeybees—which are at risk because of Colony Collapse Disorder—will be particularly important. “It’s doubtful that any other species could replace honeybees,” Tanner said, but knowing alternatives would be beneficial and that’s why identification and conservation of all bees are important.